James IV, King of Scots. James IV, one of the best loved of Scotland's Monarchs, was an endearing but idealistic character, who inspired great loyalty from his subjects. James, the son of James III and Margaret of Denmark was probably born at Stirling Castle on 17th March, 1473 and succeeded to Scotland's throne at the age of fifteen, on the murder or death in battle of his father, James III, during a rebellion he himself had actively participated in. His coronation took place at the traditional setting of Scone on 24th June, 1488. James was to carry a deep legacy of guilt for his own complicity in the rebellion which lead to his father's death, ever after he wore a chain of expiation around his waist. 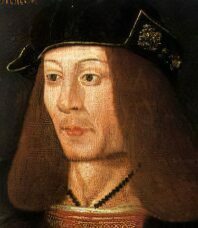 James IV was of medium stature, with reddish auburn hair, he was considered handsome by the standards of the time and was possessed of an ample quota of the legendary Stewart charm. He was spirited and courageous but impulsive and had a scholarly interest in languages, being able to speak several including Latin, Danish, German, Spanish and Italian. He loved poetry, theology and history. Unlike his father, he was to prove a strong and effective ruler. James took a keen interest in the administration of justice in Scotland and effectively crushed a rebellion in 1489. He built up a strong navy and encouraged the establishment of the printing press in Scotland in 1505. The King of Scots was initially a thorn in the side of his southern neighbour, the astute Henry VII of England, through his dogged support of the Yorkist pretender to the English throne, Perkin Warbeck, who claimed to be Richard, Duke of York, the younger of the so called Princes in the Tower. James, in alliance with Warbeck, carried out an invasion of England on his behalf and even married him to his kinswoman, Lady Katherine Gordon. After Warbeck's demise, the treaty of Perpetual Peace was negotiated with England in 1402, which took the form of a marriage alliance between James and Henry VII's elder daughter, Margaret Tudor. Henry VII sent his new "son" a finely caparisoned stallion as a wedding present. William Dunbar wrote the his famous poem the Thistle and the Rose in celebration of the marriage. The King was very taken with his young bride, who in the early stages of the marriage was unhappy and homesick. 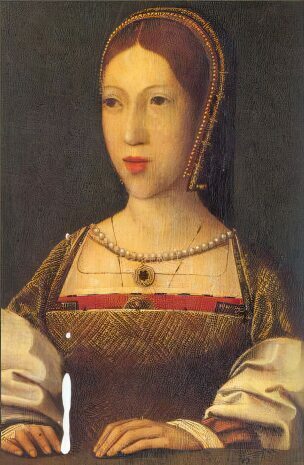 Though not a celebrated beauty like her sister Mary Tudor, Margaret was a plump but pretty young woman who unfortunately possessed the Tudor avarice in full measure. The marriage took place at Holyrood House in Edinburgh, in 1503, James professed himself well pleased with his English bride, although he was never to be faithful to her. The marriage also lead to better co-operation and more peaceful relations between the two nations. The first three children of their union, including a son, Prince Arthur, died young, but the couple eventually produced a son who survived the perils of infancy at the time, the future James V.
The much mooted peace with England was to prove but transitory. On the death of James' pacific father-in-law, King Henry VII in 1509, the English throne came to be occupied by the larger than life character of his son, Henry VIII. Tyrannical, bloodstained, avaricious and in his younger years in quest of glory, Henry VIII was to become James nemesis. In 1512, Henry joined the Holy League, in alliance with the Pope and the Emperor Charles V against Scotland's traditional ally, France. The French, in the cause of the 'Auld Alliance' appealed to the Scots for aid. Although wisely counselled by Elphinstone to exercise caution and prudence, James enthusiastically reacted with characteristic impulsiveness. The desperate French Queen sent him a ring and named him as her champion, James, ever the knight errant, took up her cause and in a chivalric gesture, professed himself her champion. Ignoring the understandable protestations of his angry wife, he delivered a defiant ultimatum to Henry VIII, then campaigning against the French in Flanders. This was arrogantly dismissed by his imperious brother-in-law. Hoping to take advantage of his brother-in-law's absence, James proceeded to the border with a huge army of Scots. The Earl of Surrey was ordered north to meet him by the English Regent, Henry VIII's first wife, Catherine of Aragon. James and his army crossed the River Tweed near Coldstream and on 24th August. By the 29th August Norham Castle was taken and partly demolished. The Scots army then proceeded south, taking the castles of Etal and Ford. Battle took place near the village of Branxton, in Northumberland. 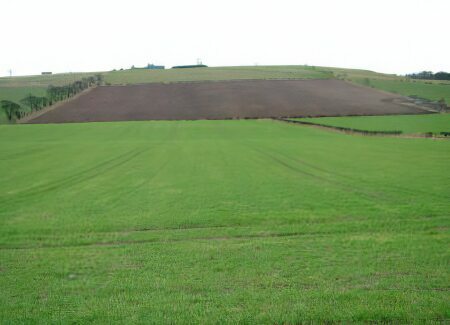 James positioned his army at Flodden Edge in the Cheviot Hills, on 9th September, 1513, the Scots army occupied a strong position on the ridge of a hill. At 11 o'clock, Thomas, Lord Howard's vanguard and artillery crossed the Twissell Bridge. James refused to allow the Scots artillery to fire on the vulnerable English during this manoeuvre. The battle commenced with an exchange of cannon fire and James, a courageous soldier but a poor general, was no longer able to control his abiding anger and impatience. Throwing caution to the wind, he abandoned his strategic position and lead his army in full charge down the hill to clash with the English. In a suicidal charge, the Scots army rode to attack the English up hill. They were attacked on their flank by Lord Dacre. The two armies clashed in a slaughterous carnage in which the English steadily gained the advantage. As dusk began to fall on Flodden Field, the flower of Scotland's chivalry lay dead on the field. James IV himself fought valorously in the thick of the battle, with a courage even his opponents could but admire. He finally fell, his body pierced by many arrows and his neck severed by a bill. The English chronicler Edward Hall, recorded "the battle was cruel, none spared other, and the King himself fought valiantly". He had inspired such loyalty in the Scots that thousands of them had followed him, even to certain death. The following morning, Lord Dacre discovered the body of James IV at the battlefield. He later wrote that the Scots "love me worst of any Inglisheman living, by reason that I fande the body of the King of Scotts." The body was identified and removed from the mound of bloodied corpses that lay in heaps upon the battlefield. After embalming it was sent to Catherine of Aragon at Woburn Abbey. In poor taste, Catherine of Aragon proudly sent the blood stained coat of her brother-in-law to Henry VIII in France as a victory token along with her congratulations. The Scottish Parliament met at Stirling Castle on 21 October, where James' 17 month-old son was crowned as James V was crowned King of Scots in the Chapel Royal.